← So much to be thankful for . . .
Thanksgiving with Chuck and Geri was fun, of course. I am not shy about eating. If someone puts good food in front of me, I’m not going to pick around and pretend to be dainty. I’m going to EAT! It’s been a very long time since I’ve had a real Thanksgiving with turkey and all the trimmings. I’m thankful I could spend it with these good friends. Geri treats their three dogs and my two by setting out individual plates of turkey with some gravy. Oh, how the crew enjoys that! Later I catch Spike lying on the couch, snuggled up to Geri, with his chin resting on her arm. He ignores me. I devote every single day, year in and year out, to making sure his every wish is fulfilled. Gee, Spike, that’s the thanks I get? Last night’s rain and the cold wind means no long walk for Bridget and Spike. “The Canine Law of Walks” kicks in: As the length of walks shortens, the number of walks must increase. We’re in-and-out the door all day. Uh-oh. My, how time flies. George, the camp host here at Elephant Butte State Park, knocks on my door this morning. He’s a nice guy, but he has a job to do. He informs me we have run past the 21-day limit allowed at New Mexico State Parks. The 21-day limit may seem silly in a campground that’s mostly empty. However, I understand the fear that campers will start raising chickens or hoist a transmission up a tree, or something. We won’t go far, probably to Caballo Lake or Percha Dam State Parks, as both are less than 20 miles from here. 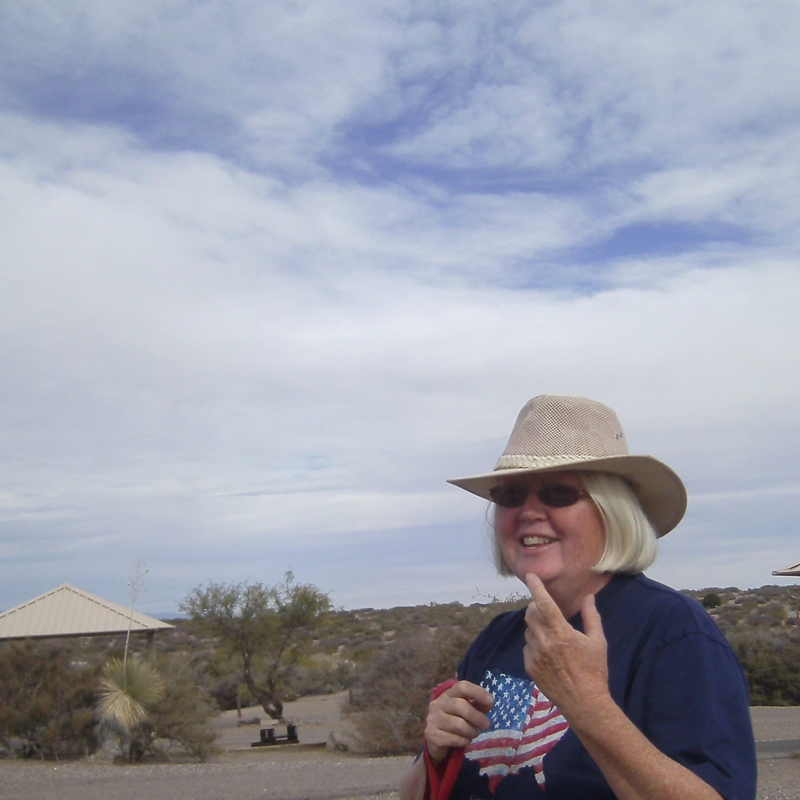 That way I can drive the PTV back to Elephant Butte for Chip to install the solar panel whenever he gives the word. This entry was posted in Simple living and tagged Caballo Lake, casita, Elephant Butte, New Mexico, Percha Dam, solar, Thanksgiving, turkey. Bookmark the permalink. We had fun cooking for you and the crew! Come on back for leftovers! 🙂 Hope you don’t have to stay away too long! Rules, rules, rules…everywhere we go, rules. I never could figger out why they limit your stay when you’re the only one in camp. But I rekon with out rules, there would be some little old lady tak’n advantage of the situation an’ build’n a pig pen out back right next to the chicken coop. Stay warm and get solared up. You stay warm, too, Billy Bob! Well, you know the rule . . . We have to stay away for a week. There’s something about this place that keeps calling us back . ..
I’ve been itching to get moving anyway! Enjoyed your writing . . .
Can’t believe you have been there that long. Have a good moving day. No wonder this place feels like home. It’ll be good to get moving again . ..
Great tips, Grace! Thank you! I’ll be sure to look for that stream and the woods. I’m told Percha Dam Park is completely different from the desert parks. Moving occasionally helps to keep things fresh. I enjoyed reading Bob’s item on bad news campers. If the three week rule didn’t exist you can be sure there would be some parks plugged with folks ‘living’ there. It can be frustrating to pull into a campground after a long day on the road only to find the place full of ‘seasonal’ campers. twenty-one days; think of all the gas you saved. I enjoyed your comment about Spike. Taking him for a walk is one thing; turkey and gravy is true love (smile). I think it’s a good rule. If you want to live in an RV in one spot forever, get a park model and go to a trailer park, right? I never would have stayed this long if it weren’t for all the free labor (and friendship) I’ve been getting! I think I detected a bit of scorn on Spike’s face when I pulled out the dry kibble on Black Friday . . .
Yeah, Spike came to his senses . .. probably because he doesn’t know how to drive. Only 7 days? Where are you? I’ve got some great readers! I love the comments . . . I had a good laugh at that, but Spike was just showing his appreciation to Geri for the turkey dinner. I came to your blog by the way of the Casita site and have been checking in on you before you got your Casita and have enjoyed it so much that I check in on you two to three times a day. Looking forward to seeing more pictures of your adventures with you and the pups. I hope you continue to enjoy our adventures. Thank you for writing such an encouraging comment. About Spike . . . I question his loyalty. Kathy (at the neighboring campsite) gave him a treat about a week ago. Now whenever Spike gets away from me, he heads right over to Kathy’s door. Sue, free range chicken ranches are so cool unless the coyotes show up for a look see…… Hmmmm, second thought better stick with the motors etc stored in the tree.